Notes | More then those of any other living photographer, Sebastião Salgado's images of the world's poor stand in tribute to the human condition. Salgado defines his work as "militant photography" dedicated to "the best comprehension of man"; over the decades he has bestowed great dignity on the most isolated and neglected among us-- from famine-stricken refugees in the Sahel to the indigenous peoples of South America. With Workers, Salgado brings us a global epic that transcends mere image making to become an affirmation of the enduring spirit of working men and women. In this volume, three hundred fifty duotone photographs form an archaeological perspective of the activities that have defined hard work from the Stone Age through the Industrial Revolution to the present. With images of the infernal landscape of an Indonesian sulfur mine, the drama of traditional Sicilian tuna fishing, and the staggering endurance of Brazilian gold miners, Salgado unearths layers of visual information to reveal the ceaseless human activity at the core of modern civilization. 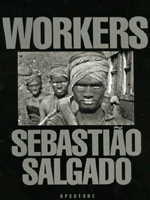 Workers presents its subjects on several interactive levels: Salgado's introductory text expands his passionate photographic iconography, and extended captions, also written by Salgado, provide a historical and factual framework. Evoking the monumentality of Baroque sculpture, images of oil-fire fighters extinguishing Kuwaiti wells are informed by data detailing this perilous venture. Heroic photographs of Cuban and Brazilian peasants harvesting sugarcane are enriched by an overview of the history of the sugar trade, which documents centuries of colonialist exploitation. On the eve of the millennium, Workers serves as an elegy for the passing of traditional methods of labor and production. Yet its ultimate message is one of endurance and hope: entire Indian families serve as construction crews to build a dam that will bring life to their land, and laborers using contemporary technology connect England and France through Eurotunnel. Honoring the timeless and indomitable spirit of the manual laborer, Workers renders the human condition with honesty and respect. Comments | [06/15/07] Salgado's work is amazing, and this book is extremely well-done. I have a large selection of photo books (puts Barnes and Noble to shame I am sure! ), and this book rates in the top 3 as the book I go to for inspiration. Comments | [05/15/07] This is my "go to" book. On every page are photos that are perfectly composed and sensative to the dignity of the subject. If you don't have this book, go get it. It's a must have. ...BTW, sorry but this rating system needs to go to "11" for this one! Comments | [09/13/04] I picked this up over the weekend, now out of print, and loved reading and looking through the entire book. The printing, both book and photographic, amazed me. Probably one of my favorites at this point.